Dorothy “Joan” Justice, 88, formerly of Arbor Vitae, Wisconsin, passed away peacefully Saturday, September 8, 2018 in Olathe, Kansas. Joan was born October 28, 1929 in Philadelphia, PA to Walter Shreiner and Dorothy Lienhardt. Joan attended Philadelphia High School for Girls and graduated in 1947 before attending a trade school in Philadelphia where she learned short hand. She participated in the new hostess training program with TWA in 1951. Joan married Keith E. Justice December 11, 1951 in Leon, IA. She was a hostess with TWA until 1952. 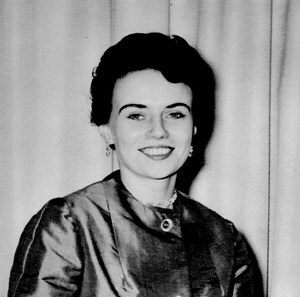 Following the birth of her first child, Joan worked as a reservations clerk with United Airlines in their Center City office in Philadelphia until 1962. After her children were grown, Joan went on to enjoy a career as a Party Planner in the restaurant industry for 30 years in Crystal Lake, Illinois. She was also the secretary of the Restaurant Association of Crystal Lake and McHenry County. In her spare time, Joan took in wildlife to rehab and release. It was common to have a litter of bunnies, baby birds and opossum young being cared for in her home. After Keith retired, they moved up to Hazlehurst, Wisconsin where Joan worked as a secretary in real estate. She was also proud to be a country-western line dancer with the Northwoods Stepper’s in Minocqua, Wisconsin for many years. Joan was also a transport for the local wildlife rescue, making hour long treks across the Northwoods to pick up injured or abandoned animals. Joan was a woman of many talents. She didn’t just love to cook, but was a gourmet cook with an impressive library of culinary books from all over the world. Her family never ate fast food! She was an avid reader, veracious in her love to learn about history and biographies of historical figures. One of Joan’s favorite down-time activities was doing crossword puzzles in the New York Times or local paper. She also enjoyed crocheting and knitting gifts for friends and family. Most of all, Joan loved spending time with family, friends or making plans to do so. She had the most beautiful smile and was sharp with her wit. Joan was giving, kind and generous with many friends from years past to current history. Joan is deeply missed. She was preceded in death by her parents, Walter Shreiner and Dorothy Lienhardt Kahlau. She is survived by her husband Keith E. Justice and their 3 children, Ed Justice of Kansas City, KS; Kurt Justice of Arbor Vitae, WI; and Leslie McElroy of Gladstone, MO. Joan has 8 grandchildren and 8 great grandchildren. In lieu of flowers donations can be made to Rock of Ages Church in Minocqua, WI or St. Jude’s Children’s Hospital. Add your memories to the guest book of Dorothy Justice. I will always remember her quick wit and her quick laugh! Also enjoyed many of her yummy meals. Treasure many family holidays in Arizona playing Charades (no one plays it right anymore). When mom had her hip surgery, Joan came out for quite awhile, maybe a couple of weeks, to cook and clean and care for us. God bless. I feel truly blessed to have been able to know Joan. The amount of love, caring, and compassion she showed to not only Keith and her children, but also to the team members at Evergreen, spoke volumes about who she was as a person. Joan and I had a special connection and she will be forever missed. Dear Family! Our deepest sympathy to you! Joan was a wonderful Person,and a Dear Friend that meant so much to so many,may the sweet Memories you shared with her give you some peace! She is in her eternal home and will shine brightly on you from the Skies above! Much Love for a peaceful heart! Linda and Roger! Remember when our mom was in the hospital with hip surgery for a few weeks in Tucson. Joan and Les? Came down to take care of us " orphans", I was in high school, 16 ? She made the best food! Took such good care of us. When she went home, it was Dad's barbecue and my very poor attempts at casserole. No wonder Pat and Mike are not excited about my cooking. Jerry and I made the trip to Wisconsin a couple of years ago to see Keith, Joan and Kurt. They had just moved into Kurt's downstairs apartment. That same wonderful food, with the added treat of Kurt's fish. We were so happy we had made the trip, and were able yo have such a terrific visit. We even got to see Joan and the other ladies practice their "stepping"! I love and miss you Joan, especially your smile. It was a pleasure & honor to know Joan & dance with her as a Steppper but the time was too short. Her life stories were diverse, amusing, and amazing. Her memory will always be in my thoughts and prayers. I will miss her and we will always recall the fun we shared in our hours of dancing. Some of my most cherished childhood memories involve "Kurt's Mommy". From flying to Pittsburgh for lunch to snowball fights with the big kids in the neighborhood, she seemed to fill my early childhood with her beauty, laughter, and spirit! The lovely picture that you have included with her obituary is exactly how I remember her. Although I had not seen her in many years, we had kept in touch. She continued to write to my mom for years after your move and my mom would always share her letters with me. While growing up, I can remember being excited to see a letter from Mrs. Justice arrive in our mailbox! After my mom's passing, Joan and I continued the correspondence and she kept me informed about all of your lives. She crocheted a beautiful blanket and mailed it to me for my daughter, MaryKate's, baby shower 3 years ago. My granddaughter was wrapped in it on her christening day - a gift from her great-grandmother's girl friend! Please know that you are all in my prayers and that Joan was dearly loved. Joan's Blueberry Pies were the best ever. Deepest sympathy and caring prayers go out to all of you! I will always remember Joan at line dancing when I would explain some complicated step. She would give me that "We're going to do what look? ", but she would always learn it and do every step and turn that was in the dance. We all loved you, Joanie. Your bright eyes and happy smile will live on in our hearts.